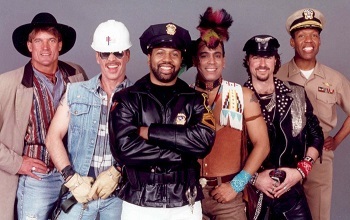 Part clever concept, part exaggerated camp act, the Village People were worldwide sensations during disco’s heyday and keep reviving like the phoenix. Producer Jacques Morali in 1977 assembled a group designed to attract gay audiences while parodying (some claimed exploiting) that same constituency’s stereotypes. Songwriters Phil Hurtt and Peter Whitehead were tabbed to compose songs with gay underpinnings, and roles and costumes were carefully selected; among them were a cowboy, biker, soldier, policeman, and construction worker complete with hard hat. The group clicked first in England with the single ”San Francisco (You Got Me)” in 1977, then reaped stateside honors with ”Macho Man” in 1978. ”Y.M.C.A.” and ”In the Navy” were worldwide smashes, both peaking at number two on the pop charts.